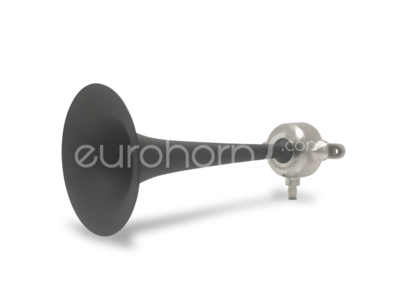 Air horn with a medium tone (377Hz). This pneumatic horn is often used as a shipping-, train-, or alarm horn. Also used in combination with the H200 as a train horn set. Pneumatic air horn which is often used as marine-, alarm- or train horn. Brass horn painted matt black. as air horn set on European trains. "on board" air supply in combination with (solenoid-)valve.